Bonfire of the Vanities: What's Oliphant's point here? Can someone explain this cartoon to me? I used to like Oliphant, even if he is a liberal; I think he's a good artist, and often clever. Sometimes I agree with him. But...this cartoon. OK: he wants to say Alito is, what? A friendly Scalia? Is that it? There's something off, something sinister, about this -- and I don't mean about Alito and Scalia. That one doesn't make any sense. Is that even Scalia? It looks more like Nixon. I think his point was that he wasn't being very clever and he wanted to make a joke about the "Scalito" nickname. By the way, should a Catholic judge, if presented with a case involving a duly-passed abortion law, rule in favor of the abortion law if the pro-abortion side "deserves" to win the case (I'm sorry I'm not too sure how to phrase that)? It seems like Alito may have done this in a few cases. Why think when you can doodle? Don Juan: As an appellate court judge, Alito was bound to follow decisions established by the high court. But as a Supreme Court justice vested with the powers of judicial review, he would be free to examine cases for their fidelity to the Constitution. The more I'm learning about Alito, the less happy I am. He has favored pro-abortion cases 3/4 of the times and only sided with pro-life cases 1/4 of the time. I hope he's not a Kennedy in sheeps clothing. The point was that the press and the pundits have been comparing Alito to Scalia from the offset. And Oliphant decided to have a little fun with it. By the way, I've met Judge Scalia at church. Don't listen to all those mean things people say about him. He's a good guy, with a little something called "conviction." That and the outlandish notion that the Founding Fathers had certain things in mind (and other things definitely NOT in mind) when they wrote the Constitution. To paraphrase a country song, that's his story and he's stickin' to it! I think highly of Justice Scalia, and I dismiss the caricature of him. That's why I see something sinister in Oliphant's cartoon. He draws him in a hackneyed, Nixonesque mode (I saw right away); and that seems rather clumsy. And it does seem to me to trade in ethnic stereotyping--the name, and the chosen imagery. But perhaps he really is lampooning the "Scalito" talk; perhaps we are meant to recognize the second and third images as absurd constructs. I guess--and here I am playing amateur art critic!--the third image fails as the needed "punchline." It is simply too ambiguous to make the point. 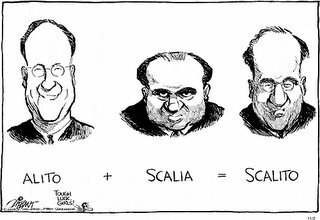 Because were I to interpret the cartoon, I think it's saying, this is what we'll get if he's confirmed, and his jurisprudential "dna" is mixed with Scalia's: hence the message in the lower-left corner: "Tough luck, girls!" And, if I'm right, then Oliphant is saying there's something similar and sinister about these two--and he's chosen to represent that ethnically: with their names and physical appearance. That's what I consider truly sinister: liberal racism that gets a free pass. Is Oliphant guilty of that? I don't want to accuse him of that; but his chosen imagery raises the question. And it wouldn't be the first time--have you seen how he is wont to depict Condoleeza Rice? Mr. Oliphant has succeeded in showing us the brilliance of his art and the poverty of his wit, all in the same sequence. What a feat!